Why Should You Learn More About TracPoint? Our solutions are created for multi-location businesses to meet the challenge of cutting through the world of clutter and advertising noise. We speak your language. No more confusing algorithms and codes to crack to figure out how to market your business. We give these solutions to you straight so there's no confusion. With over 15 years of experience creating marketing campaigns for thousands of retailers, we have developed innovative solutions that are proven to deliver results. Manage your social media from one central login. Control content and posts for all your locations, view and respond to reviews and comments, and monitor page growth and activities with reports. Increase your reputation on Facebook, Yelp and Google with this automated service. 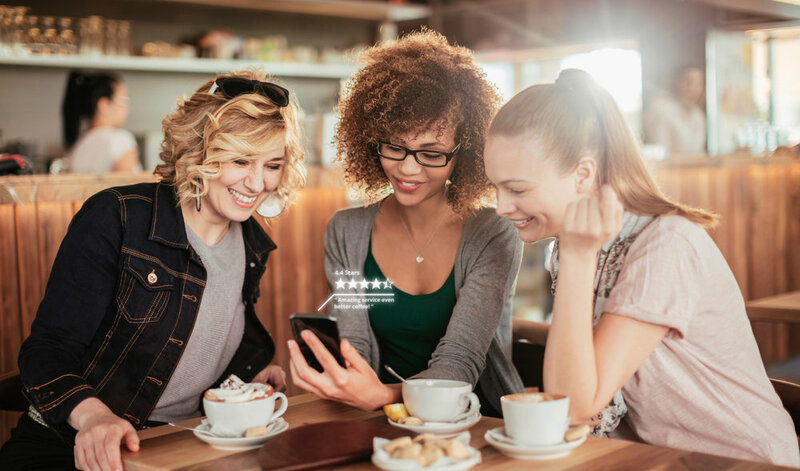 Increase the number of positive reviews while reducing your poor reviews at the same time. Mobile apps provide businesses of all sizes a feature rich and affordable solution to deploy a beautifully designed custom app that increases customer loyalty. Easily create customized professional digital coupons and landing pages for your brand. This drag-and-drop platform is simple enough for anyone to use while providing incredible analytics on clicks, redemptions, and more. Print products are completely customizable and designed to get your brand in customer's hands! TracPoint offers a solution for everyone whether it's direct mail, promotional products, or an online print portal customized just for your business. See first-hand how TracPoint can help you better manage your digital knowledge and attract more customers.